The machine can transfer colorful pictures and words of sublimating solvent printing inks on caps. Can be used to smooth and shape in the production of all lots of caps, handkerchiefs and other commodities. The machine should be tightly connected with the ground. Machine is heavy duty, commercial grade, super stable and built to last. Easy to use. This machine is not suitable for minors to use or food processing. 5.After machine reach temp you set, then place cap on the working table flatly, place the photo you printing on cap, then press down the handle. When the machine reach the time you set, it will alarm, you could take out the cap and peel off the paper, then photo will transfer on the cap. 【LED Display】This machine has nice outer appearance with fine workmanship.This heat press machine digital LCD timer and temperature control function can make it more accurate. 【Can Be Fully Adjusted 】Handle applies closing pressure through a spring and pressure-plate system, which allows pressure to be more evenly distributed across the entire platen when is closed. 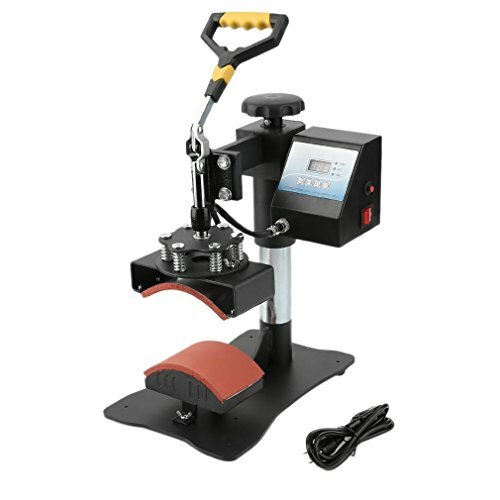 【Advanced Configurations】This heat press machine can be able to apply transfers, letters, numbers and images on cap, baseball hats and any other items.High quality and bear high temperature and heating board is more safe and durable for use. 【Main Advantages】The machine can transfer colorful pictures and words of sublimating solvent printing inks on caps.suitable for producing gifts, decorations.